You only get one chance at life, then you die. The game's over, no second chances. But she was never one to follow all the rules. In a strange twist of fate, a woman flees purgatory only to jump into a newly vacated body. When she wakes in the hospital, she has a brand new life and a whole lot of unanswered questions. Now she's Micah Munroe, a real estate agent with broken memories of the life she once lived. A mysterious man who claims to be Death says she's his granddaughter and that she's something called a grimm. Sully knows she's an imposter because he reaped the soul of the real Micah only a week ago. He suspects she might be a misplaced shadow, what he calls spirits and vengeful ghosts. He becomes obsessed with finding out who she really is and just how she inhabited a new body. He'll stop at nothing to find the truth and send her back to purgatory where she belongs. What he didn't bargain on was how his body would react to her or how powerful the white light within her is. When a powerful shadow and her horde of angry spirits kidnaps Sully's best friend, they must work together to get him back. Fighting their feelings for each other isn't half as difficult as fighting the army of shadows bent on starting a war with the living. 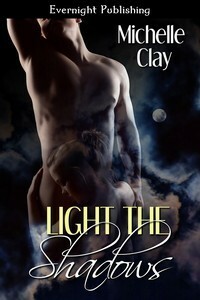 Light the Shadows is the story of a second chance at life - for many people. Our main lady (we'll call her Micah since we don't know her original name) freaks out when she finds out she's dead and runs away into a new body. This isn't supposed to happen, and when Sully accidentally runs into her one day, he knows something is up. But Micah isn't the same, not with another person in her body - and she latches onto her new life with gusto, has a makeover, and decides to make a go of her second chance. Anna, the guide she met in her brief time on the other side, keeps popping up and trying to offer advice and help out in her own little way (she was a wonderful character!). Micah's relationship with Sully gets off the a rough start, especially since he thinks she a poltergeist or vengeful spirit. It doesn't take all that long for the sparks to fly between them, but they have a lot to overcome first, including an impossibly strong shadow bent on destroying the world of the living - starting with Micah and Sully. There were very few slow spots in this book, but it was never very overwhelming. I loved that it seemed to move along on its own without me needing to push through parts of it. The ghost story helping to drive things along was a great mystery, with a few surprises along the way as well. Sounds like it would be well worth the read. I like stories like this, thanks for the review. It was something very different! That can be hard to find anymore.